Happy Friday friends! This week has been a long one, so I'm more than happy that the weekend is here. If you follow me on Insta Stories, then you may have seen that I was a little stressed about an upcoming trip. I have a conference in Oklahoma at the end of the month, and although I am super excited for it, I realized that had the WRONG dates for the conference, and scheduled my trip a week early! Talk about #mombrain. All is well now, but lets just say changing everything two weeks before the trip was a little stressful. On another note, today I'm sharing the perfect shirt. Not only is it actually called the perfect shirt, but it truly lives up to its name. I love the classic button down fit, and the material is light weight, making ideal for the spring and summer. 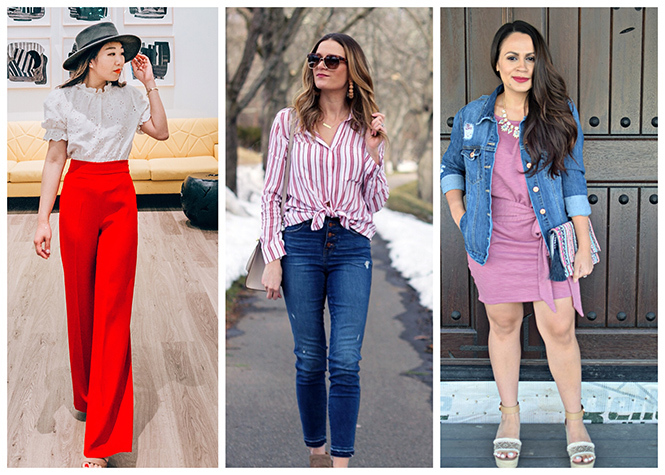 I wore it here with my favorite high rise button front jeans (seriously obsessed) and open toe booties (under $35), but I can't wait to style it for the summer. It will look great paired with denim shorts, or thrown over a tee shirt dress as a warm layer (because you all know that I'm always cold). I can also see myself wearing it over a bathing suit when I'm out on the boat. Not a fan of the red stripe? It's available in six different colors, including a gingham print. Although the shirt runs true to size, I sized up to a medium for a slightly oversized look. Have you taken advantage of the Shopbop sale? There are only two days left, as it ends on the 14th. You can shop all of my top picks here. The feature blogger is Nistha from Fashionistha. I'm loving her updated take on the polo shirt. Make sure to stop by her blog and say hello! I always love a great button down and this one is perfect. I love the purse - it is perfect for spring/summer! I'm loving this cute tie top! It has a fun summer feel to it, and I'm so loving it!! Glad you worked out everything for your trip too - how stressful.. Such a cute striped shirt dear! Simple, yet very pretty and versatile. Looks great with denim pants! Fabulous look! I really love your jeans. Oh gosh, that had to of been stressful, especially with flights! We just had to book flights for 2 trips and man, I didn't realize how fast the good (direct) ones book up! Oops! I love this red/white top and its cute little tie. Those button fly jeans are so fun as well! Simple, classic style and that I love the striped shirt. I am loving blouses tied at the waist for spring/summer and this striped one is so chic! Not only is this the perfect shirt I think that those are the perfect jeans too! I love the buttons and the raw hem! Fantastic jeans! The hole look is fabulous! Happy weekend! Rachael, I love this outfit on you! And those earrings are super cool! Have a great weekend. This top is so cute! I love the stripes and how you knotted it! These jeans are my absolute favorites, too! They look soooo good on you! I'm so happy you caught the travel mishap - it could have been so much worse! OOf! I love how those jeans look on you! They are so flattering! That top is really cute too! This is such a great outfit, you look amazing! When does the mom brain ever go away? I swear this is my life everyday! I am loving this stripe button down, definitely the prefect shirt. Cant wait to see you style it with a swimsuit, if the weather ever decides to really warm up!